Notes on a two-week residency: what, who, where, when, how, why, and my experience of the LPP Residency in the 1240 Minnesota Street studio building. I just wrapped up Little Paper Planes’ LPP+ residency in San Francisco. A private studio in 1240 Minnesota Street, Minnesota Street Project‘s Artist Studio Program. Support and promotion for a public event (artist’s talk or reading). Access to the resources at 1240: a kiln, woodshop, digital media lab, and Adobe resources. 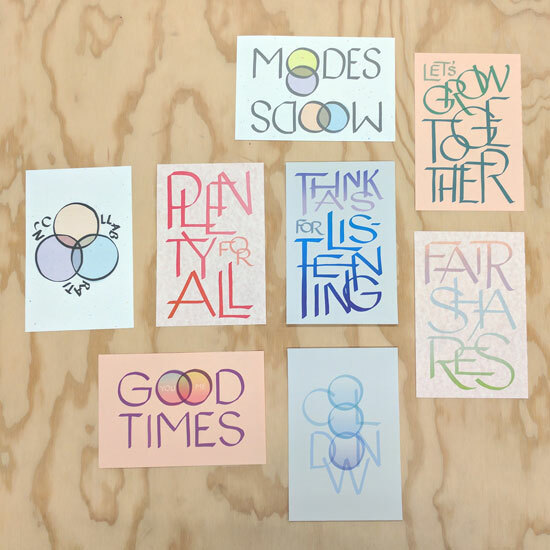 In return, artists-in-residence are asked to present at the public event, and make a ‘zine or print multiple (usually a small edition of 20-25) related to their residency for sale in the shop to help offset the cost. Little Paper Planes’ residency studio at 1240 Minnesota Street. I added (and removed) the drying and tool racks. STUDIO. The studio is probably about 8’-9’ wide by about 16’ deep. It is located in 1240’s second story, off the digital media lab. The second floor also has a small kitchenette and a restroom. 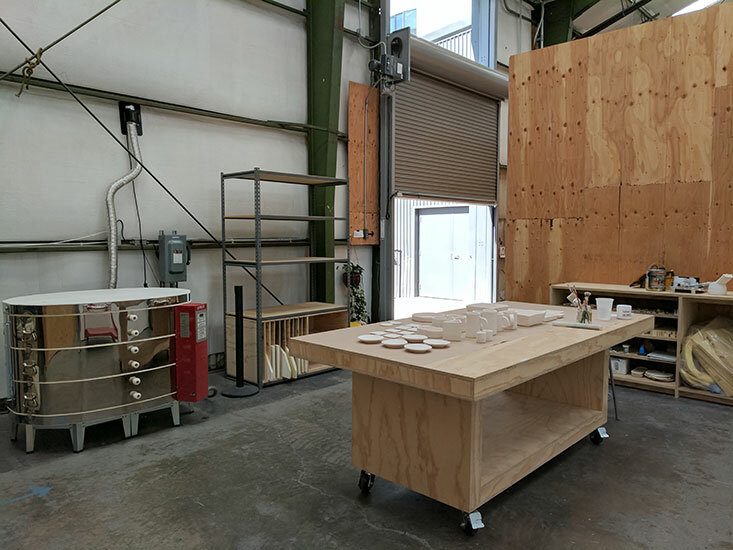 It gets a little bit of natural light from a nearby skylight, and there is a large worktable (4×8’ sheet on sawhorses), a drafting table, and a folding chair. PUBLIC EVENT. I had a talk inside a white cube studio/gallery in the middle of the complex. It was pretty low-key and DIY. Kelly lent a projector and I set up stools and got cups and snacks. Electric Kiln. The kiln is huge and programmable. My ceramics knowledge is limited, and that’s all I can say confidently about the kiln. AIRs should bring their own (cone 5) clay, (cone 5) glazes, and clay tools. Note that while I was able to purchase clay at Douglas and Sturgess in SF, I had to go to Clay People in Richmond for glazes. Thinking ahead and ordering your supplies to be delivered is advisable. Note that there’s no wheel; I hand-built all my ceramic objects. Kelly helped me load and program the kiln for both of my firings. The woodshop is beautifully organized and maintained by Jesse Schlesinger. There’s a fancy saw-stop-outfitted table saw with a 48”+ outfeed table, a sheet saw, and sliding compound miter saw with a lot of possible angles. These are all attached to dust collection systems or vacuums, and there’s air filtration system too! 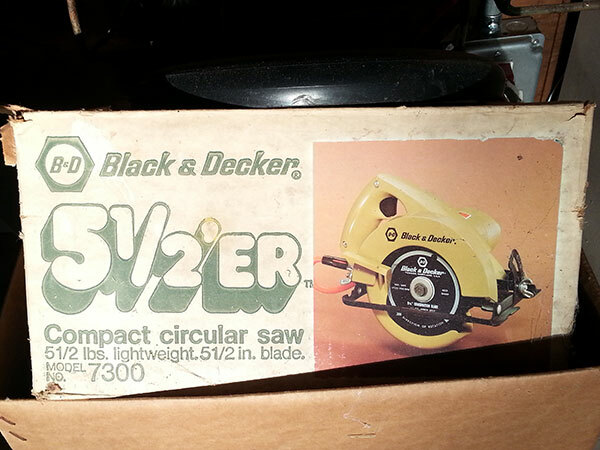 There’s also a planer, an orbital sanders (and a handheld belt sander if I remember correctly? ), a jigsaw, and a reciprocating saw. There are a variety of hand tools including two sets of Makita drills and impact drivers. There is also an impressive clamp cart. Minor expendables like sandpaper and personal protective equipment like goggles and ear protection are also available. It was easy to schedule an orientation early in my residency with Jesse, who is very meticulous about safety and cleanliness. He was flexible in letting people get approved to use some machines and not others according to their comfort level. There’s a digital media lab with a large (44 or 48”?) inkjet printer. Residents should get an orientation from Sean McFarland and bring their own paper. You pay for ink by self-reporting on a clipboard. There are also two scanners—one flatbed ~12×18”, one smaller flatbed for film. There are at least three iMacs too. There’s also a color laser printer that accepts up to 11×17” paper (75¢ per US Letter per side). I used that to print my postcards, which had really vibrant colors. I got my paper at Kelly Paper, one of the great weird chain stores of the Bay Area, where you can purchase papers by the sheet. I cut the postcards down on a really nice rotary trimmer that studio member Miguel Arzabe made available for shared use. There’s also an Adobe studio, as in Adobe the software company, on premises. I had my clay work cut out for me so I declined learning more about those resources. During my stint they had a screen-printing workshop, though you have to have screens burned by an offsite service provider. There are also other resources at 1240: a full kitchen, a patio area with picnic benches that are a great place to work on sunny days, bountiful carts for moving things, lots of brooms, dustpans and work sinks, and rolls of brown butcher paper available. One of the studio artists is also setting up a darkroom. I was really impressed with the amount of space and the quality of the resources. It’s clear that the vision for 1240 is to make it nice and keep it nice! Many artist studio buildings exhibit a scarcity mentality (I’m thinking of some warehouses in NYC; some don’t supply toilet paper, and others are just fluorescent-lit hallways of closed doors where you rarely meet neighbors.) 1240 feels very deliberately abundant and supportive. There’s also a free area where I found useful wood for my slab rolling, and some great rulers and stencils. There’s another area with extra furniture, where I found two wire racks and a pair of sawhorses for drying my clay pieces. Being able to scrounge and find good stuff, and to leave behind stuff to share is so great for traveling AIRs. In addition to these resources and staff support, the community at 1240 was really great. Little Paper Planes is a store featuring goods by artists. It was founded by artist Kelly Lynn Jones in 2004, and has had a storefront in the Mission District in San Francisco since 2013. Kelly and I were classmates in the MFA Fine Arts program at the California College of Arts in San Francisco. I was happy to be allied with an independent, woman-owned, artist-owned business in San Francisco, especially one with accessible price points. Kelly is really chill. She was very easygoing about everything. She didn’t have any paperwork for me aside from 1240’s contract. I initially proposed to make ceramics for activity kits and games. Two weeks is quite short to make ceramics, so I switched to making pottery (which for me is more intuitive), and Kelly seemed totally cool with it. I also wasn’t sure what the outcomes from the residency would be, and how many objects she would want for the shop. She was really easygoing and didn’t want to take too many objects, which worked out great since my glaze technique can use improvement. She also mentioned making a ‘zine that reflects the residency, and was very open-ended about the format and the time line. I wanted to finish it before I left, so I made postcards (not a zine!) and she was totally cool with it. 1240 Minnesota Street has a healthy staff of artists. In addition to Jesse and Sean, there’s Brion Nuda Rosch, the director. Michael Rubel is in charge of facilities and is really friendly and helpful in receiving shipments. Furthermore, the 30 or so studio artists at 1240 seem really dedicated to creating a friendly community. My residency happened to overlap with a BBQ/potluck, and it was really nice to meet folks. I am fortunate in that I lived and practiced in the Bay Area for a long time, so I already had met Jesse and Sean before, and was friendly with studio artists like Dana Hemenway and Richard T. Walker. 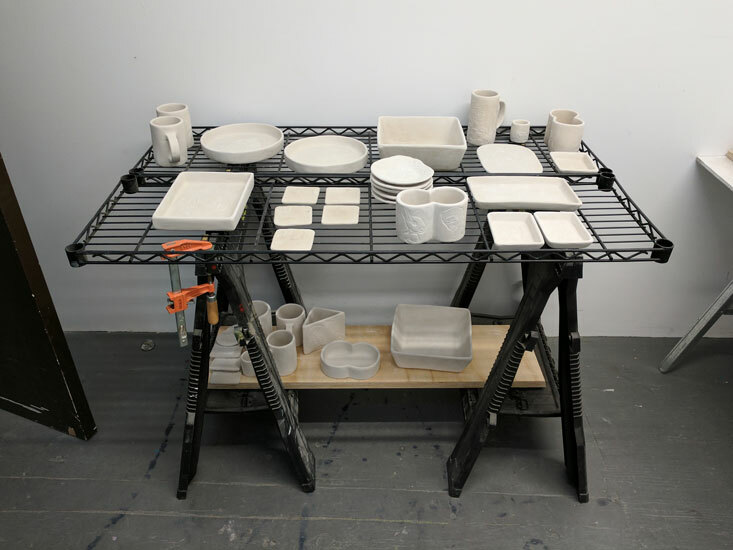 I really got the feeling that studio artists have a sense of ownership in 1240 and feel responsible for contributing positively to the shared resources, whether with knowledge (such as helping to run the kiln), labor (helping set up the BBQ), or good will (sharing food and welcoming new artists). The value of being part of 1240 extends far beyond the square footage of a private studio. 1240 Minnesota is across the street from the Minnesota Street Project, on—of course—Minnesota Street in the Dogpatch neighborhood of San Francisco. A huge Philz Coffee is next door. There are more restaurants about two blocks away. Center Hardware is also nearby. I have family in the area, I had access to a car and accommodations. By car, 1240 is really convenient off of the 280, though parking can be tough. I didn’t have to take public transportation but the Third Street light rail is two blocks away. I opted for a two-week residency. Kelly gave me option of staying four weeks, but with no stipend, I would have been financially overstretched. Also, a shorter time frame was better back-to-back with another residency. I am new to clay, so I didn’t have to foresight to realize that two weeks is very short for ceramics. It took about four or five days for wet clay to get bone dry for bisque firing. Then each firing took about 36 hours. I really had to jam the first seven days to get the studio up and running, get all my supplies, and hand build my 50 pounds of clay. I was also able to get a three-day extension, as the next artist wasn’t moving in for another week. I can envision a wide variety of artists enjoying the resources at 1240: photographers, woodworkers, clay (hand-builders), and drawers/painters. Those resources are plenty of reasons to apply for the residency. I was also really attracted to learning more about Minnesota Street. Minnesota Street Project opened a few years ago, when many SF galleries were closing. I think it has brought a lot of fresh energy and optimism to artists and gallerists in San Francisco. My residency overlapped with the San Francisco Art Book Fair at MSP. Kelly was kind enough to invite me to be a featured artist at her booth, so I contributed ‘zines and letterpress prints from my Working Together series. I enjoyed SFABF as a visitor, too—it was great to see so many local and out-of-town artists and publishers in one really buzzy, exciting place. I really had a great time being part of the 1240 community and accessing the resources there. When I realized I needed to make some molds, I scrounged in the free area, found some wood, chopped it up, and had three molds within an hour or so. Back in NYC, accessing a woodshop is much more complicated for me. When I glazed my bisque pieces, I worked on a large table in a communal space near the kiln. A roll-up door was up, letting in sunlight and a light breeze. It was just so pleasant. Glazing in the shared space on a pleasant SF day. The residency aims to provide opportunities for artists to experiment. Having not done ceramics since high school, I took a hand-building class at La Mano Pottery (an independent, women-owned business in NYC) this spring. The instructor (and La Mano co-owner) Julie Hadley was very encouraging. It is so nice to feel unafraid to mess up, especially when you are learning new techniques and trying to get comfortable in a shared space with clear rules and etiquette established among members. In five classes, I learned enough to figure out what kinds of tools I liked and needed, and was able to hand-build pieces that remained intact in the kiln! I had shipped out the linoleum blocks from Working Together (only realizing in hindsight how much money I would have saved in shipping if I unmounted the blocks in NYC). I used the linoleum like stamps, imprinting them in the wet clay. I only dip glazed two pieces at La Mano, however. So when it came time to glaze my LPP pottery, I was treading on thin ice. I bought four quarts of glaze and hadn’t tried any of them before. I suppose an experienced ceramicist would have insisted on making some test tiles. Quarts are very small quantities for dipping, so I applied by brushing. The instructions suggested 2-3 coats, which I suspected to be too heavy, and indeed, the results were often unsatisfactory. Though it was disappointing that many pieces didn’t come out as I’d hoped, I have the perspective to see that perfect outcomes would have taken a lot of dumb luck, given my minimal skills and experience in ceramics. I learned a lot and had fun. I gained some confidence in my hand-building and valuable lessons in glazing. I am so grateful that the residency aim is experimentation. 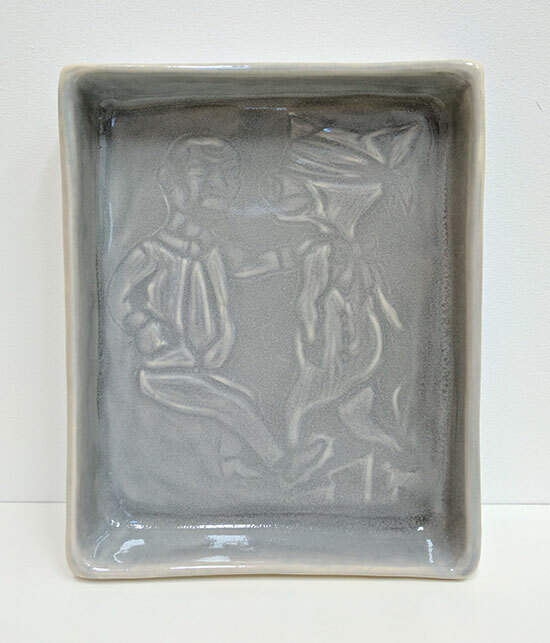 A small serving tray, imprinted with the image of Subjugation and Obedience, will be available at LPP. A trivet with the image from Dropping the Ball and Picking Up the Pieces, and a “Cool Down” postcard. I am also happy with the print multiple I made. At first, I sketched illustrations of pottery, but it felt like someone else’s work, or like a Bay Area motif. I realized that just plain calligraphy, like the Working Together book cover, would be true to me. I took full advantage of the chance to print on weird papers, and use lots of colors that would be quite laborious to print on letterpress. Double plant pot and postcards available at LPP soon. The set of 8 postcards is called MOODS & MODES. Some reflect the ideas in Working Together (“Thank you for listening” inspired by “Listening”). 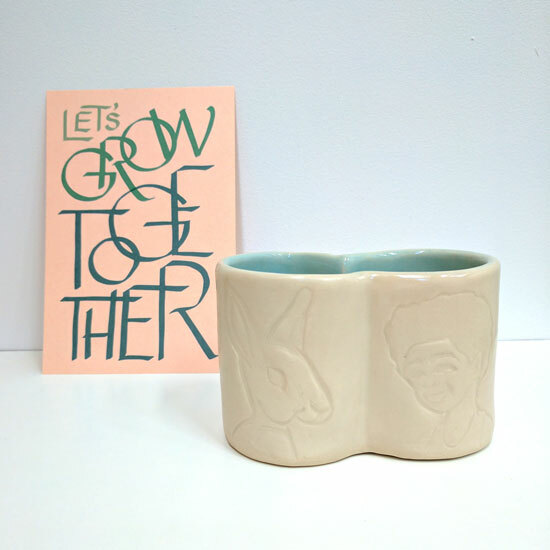 Others are inspired by the pottery inspired by Working Together (“Cool down” came from the trivet, which was inspired by “Dropping the Ball and Picking Up the Pieces;” “Let’s grow together” relates to the double plant pot inspired by “Shared Growth”). MOODS & MODES will be available at Little Paper Planes, which is currently renovating and will re-open with a studio for art classes next week. You can support LPP’s Kickstarter to offer classes. Huge thanks to Little Paper Planes, Kelly, 1240 Minnesota Street, Brion, Jesse, Sean, Michael; Dana, Miguel, Beth, Liz, Sandra, Henna, Richard, and all the kind and welcoming studio artists; Genevieve and Elizabeth; and Michael, Angela, and Sophia. Notes from the first half of a printmaking residency in Berkeley, CA. A view of Kala’s printshop. I just wrapped up my first of two stints as a 2015-2016 Fellow at Kala Art Institute in Berkeley, CA. Kala is a 40-year-old non-profit arts organization, at the heart of which is a massive print shop in the top floor of a former Heinz ketchup factory. Their printmaking facilities span etching, stone lithography, relief, letterpress, and screen print. They also have an electronic media center with a 44” printer, a darkroom, and a shooting room. Around the corner, they have another space, which includes a gallery, collections, a classroom, and three project space/studios. It’s like an Artist’s Playland. 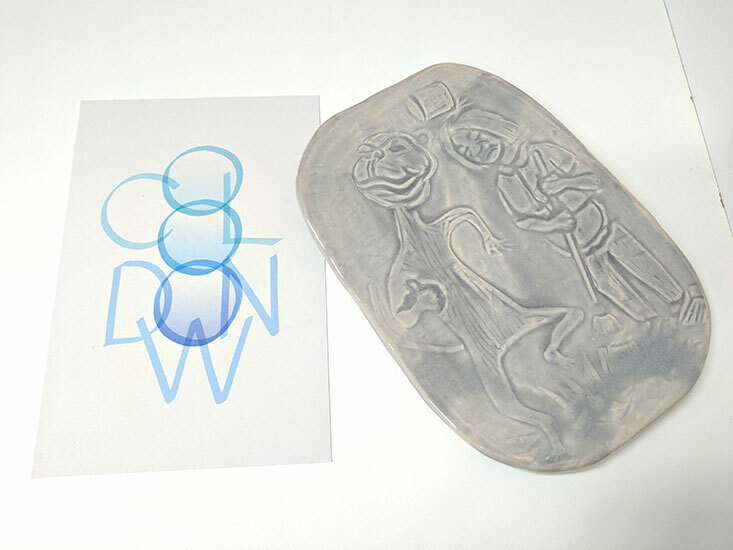 As a fellow, I receive access to the printmaking studio, free tutorials, a free class, the use of a 100-square-foot private studio, a discount on classes and purchases, and a stipend. Demo from the Repeat Pattern Screen Printing class with Emily Gui. The fellowship lasts up to six months. I’d heard that a few past Fellows were able to be active all six months, but many were not, likely due to finances or jobs. The Bay Area’s high cost of living is another limiting factor, for international artists and at least one other NYC artist I’ve corresponded with. I have also been told that many Fellows schedule their stints towards the end of the Fellowship period. I committed to 2.5 concentrated months due to finances and logistics. I just wrapped up a 4.5-week stay from early January through early February. I will be back for a second stint in June and July to make more work and to install my work in the Fellows’ show and attend the opening. The exhibition is scheduled to open in mid-July. I was mostly focused on studio work, but I was able to visit the re-openings at Berkeley Art Museum and the San Francisco Arts Commission Gallery, and Related Tactics: Declarations for the New Year at Southern Exposure. I also enjoyed the Kala Artists’ Annual in the Kala Gallery (on view through March 26)—it’s a great way to be introduced to the work of the AIRs that I was working alongside, and be inspired by the range of work and media. Actually, I’d been in a Kala Artists’ Annual many years prior. I interned there after undergrad, and used the presses for my reduction woodcut prints. In the intervening years, I visited the gallery, wrote about an exhibition, and submitted applications to the Fellowship program. I think my familiarity with Kala, printmaking, and the region were very helpful in my planning and expectations. Artists couldn’t ask for a better location. Just across the parking lot from Kala are a large hardware store and Looking Glass Photo & Camera, probably the best photo store in the East Bay. Across San Pablo are independent businesses Discount Fabrics, MacBeath Hardwood, Ashby Lumber, and Urban Ore (building materials salvage). An art supply store with a decent selection of printmaking supplies and paper is located 1.5 miles away. Just across the street is Berkeley Bowl West, a fantastic grocery store with prepared food. Its produce section is probably bigger and fresher than anywhere I’ve been. You get healthy grab-and-go food or stock up on groceries in the Kala kitchen. It’s a major perk of the location. Kala’s split spaces—print shop and gallery—are located on different sides of the same block. To access one from the other, you can walk through loading docks and a parking lot, a sidewalk that fancifully circumnavigates trees along car-heavy San Pablo, or through neighboring JFK University and more loading docks. It’s not far, but it feels like it is. This part of West Berkeley was industrial, and the building has its own monolithic architectural beauty. However, artists should note that access is easiest for those who can readily climb a short ladder, walk steep ramps, and climb stairs. I borrowed a car, which made a world of difference for my commute from the peninsula (south of San Francisco), and getting supplies. West Berkeley is not very close to BART (the subway/commuter rail system). For artists coming from out of town, I recommend staying as close to Kala as possible. If not, having a car—and a high tolerance for traffic or the willingness to commute during off hours—will be useful. At the very least, I think you’d want a bike and a bike map. This year there are eight Fellows. Kala also has about 50-70 artists-in-residence (AIRs). The AIR program is similar to a membership, allowing access to the print shop and media center. For local artists working in print and digital media, the AIR program’s tiered rates can help make it a great alternative to a private studio. As a young person, Kala Art Institute was an amazing place to be—a shared facility for printmaking with an ethos of collectivity and collaboration. This was seminal in my thinking about artistic practice as part of a larger dialogue, a community. It was (and is) a real community of artists whose ideas and work didn’t exist in the vacuum of a solitary studio, but rather was in the open and collectively shared. The notion of gestalt—the whole is more than the sum of its individual parts—took root for me then. At Kala, I encountered these moments of serendipity. It’s a communal space, so I admired Emmanuel Montoya’s oversized woodcut prints, and the nearly silent way he and his assistant worked together. Having only ever seen monoprinting with oils, I was impressed by how an artist used watercolors on her acrylic plate, and she kindly explained the process. Often the print shop felt like an atelier—artists were quietly engaging their solitary studio practices, respectfully allowing others to do the same. Then, someone might put on the water kettle, and gradually artists gathered for lunch, and there’d be a friendly, energetic dialogue. My most meaningful instance of serendipity is being a concurrent Fellow with San Francisco-based Leah Rosenberg. She began her stint in January, too, following her residency in Omaha and project in Hamburg. In the past, she and I collaborated with the late, painfully missed Susan O’Malley. Re-connecting with Leah, at Kala (where Susan’s “Be You” mural for Print Public is just across San Pablo) was some sort of cosmic gift, a confluence of Kala’s mysterious ability to survive an economic environment hostile to arts organizations, the jurors’ visions, and our own good luck. We are collaborating on a participatory project for the exhibition in July. It was also so nice to have a buddy. Doing a residency can be isolating—you’re away from your home and partner, and somewhat at the mercy of an institution yet on a self-directed journey, so having someone to share the experience and mutual support is strengthening. 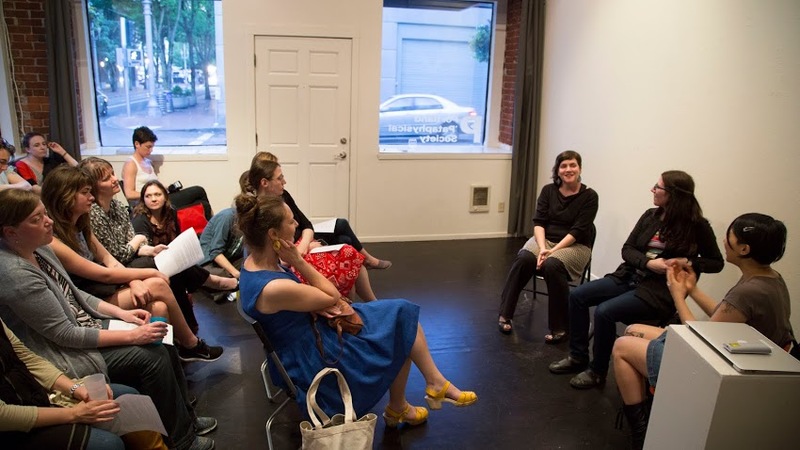 Fellowships are awarded via an annual open call juried by outside curators and artists. I’ve lost track of how many times I’ve applied. I submitted an application last spring, and got an email requesting confirmation of my interest in summer or early fall. I’m finding that artist’s experiences of residencies are highly shaped by the liaison, and Artist Programs Manager Carrie Hott (see her work, which I’ve mentioned here) was professional, responsive, interested, and interesting. The Fellowship seems set up to support artists and let them get to work. At the Orientation, Studio Manager Paper Buck (see his work) asked us what media we’d like to use, and what tutorials we’d need. On the spot, he incorporated a screen coating and exposing tutorial. Carrie handed out keys to residents and fellows. That was day one. We were free to access the studios 24/7. Changing out the tympan in a Vandercook letterpress tutorial with Carissa Potter Carlson. Kala relies on an honor system, and trusts AIRs and Fellows to work within their experience levels. If you are fluent with a piece of equipment, they might briefly talk it through with you, or they might leave it at that. If needed, you can request a tutorial. Brief tutorials are free and scheduled with individual staff members and teachers. You can also request a longer tutorial—available to AIRs at an hourly rate of $40, which I think is very artist-friendly, and free for Fellows. Kala also offers a free, completely optional class to Fellows. It took me about a week or two to get rolling in the print shop. 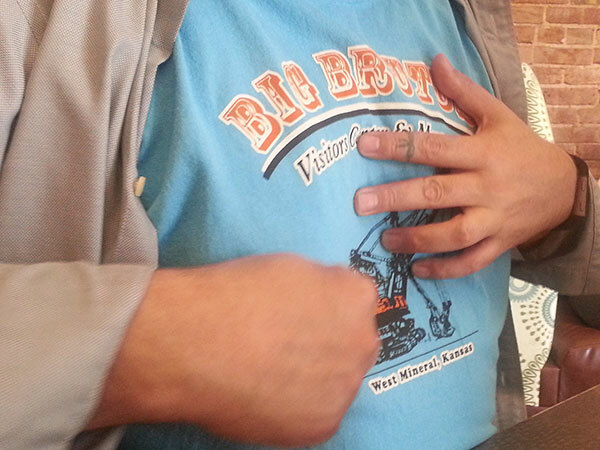 When I was eager to get a screen printing refresher, an AIR was kind enough to walk me through it. Kala’s requirements of Fellows are minor—donate three works (typically editioned work) to the permanent collection. Include credit lines. Submit good photo documentation. That’s pretty much it. I had an overwhelmingly positive experience over the past few weeks. I’ve been exploring artists’ agency and interdependence, and want to make activity kits along these themes. I shipped my sewing machine to Kala, but ended up wanting to use my time at Kala mostly to print; I can always sew back in NYC. I did a lot of screenprinting on fabric, a little bit of letterpress and polymer plate, one woodblock (thanks to encouragement by KBC), a little participatory project, and the collaboration with Leah. I had books about artists’ self-organization and alternatives, but put off reading them. Printmaking is preparation-intensive, and I felt like I had plenty to do in the print shop everyday. I’ve been mulling these podcasts and articles. “Brené Brown: The Courage to be Vulnerable,” On Being with Krista Tippet, January 29, 2015. Why? See next paragraph. Mandy Len Catron, “To Fall in Love With Anyone, Do This,” NY Times, January 9, 2015. I love the idea of questions that cut to the core of your identity—of knowing and revealing your most authentic self. Tim Boomer, “The End of Small Talk,” NY Times, January 14, 2016. If there was any stress, it was completely self-inflicted. At residencies, I am quite aware of the many artists who would like the opportunity I have, and I tend to want to earn the right to be there by being very productive. But the creative process isn’t linear. And I dabble around in too many media for processes to go perfectly every time. I usually reach a point where I have too many ideas and not enough time left, so I try to simplify and prioritize. The hardest part is letting go of what I can’t or needn’t do. For example, I re-printed a three-color repeat pattern screen print on 10 feet of fabric. It took me about 1.5-2.5 hours every day for six days. If I were able to let go of the flaws and mistakes of the first print, and adhere to my list of priorities, I would have moved on to other projects. But I was obsessed: I knew I could make it better. Printmaking can be highly technical. For some, its established markers of craftsmanship can make it intimidating, and mastery expressed in minutia can make it seem arcane. But printmaking can also be looser and inventive. I like how you can also make it up as you go along, like making jigs—improvising and refining combinations of materials, time, pressure, and alignment. A folded playing card is a great tool for picking up prints from the press. A “jigsaw” woodcut of squares and triangles could be done in minutes on a miter saw. A plastic sheet can be a backing for screenprinting a t-shirt, or a tympan for printing a woodblock. Do whatever works. I devised a simple pulley system for printing and drying yards of fabric. Exhibitions by Matisse, Goedel, and Kentridge. A few months after I put up a map of the world with the loose intention of inspiring more travel, M surprised me with a short, spontaneous trip to Amsterdam for two of our favorite things—riding bicycles and seeing art and design. Here are my highlights. As a young art student I was deeply inspired by Matisse’s paper cutout collage. I loved how they were joyful and expressive, and full of movement and freedom. I missed them when they were at the MoMA, but it is just as well as the Stedelijk wasn’t very crowded last Friday afternoon. There are two segments of the show. Downstairs, smaller galleries identify Matisse’s stages of development, often correlated to periods of travel, and show works alongside others by Matisse’s contemporaries. It was like a who’s who of early 20th century art, with Fauvists, German Expressionists, Supremetists, and more. I thought a lot about luck and privilege—the happenstances and conditions that contributed to Matisse’s development—being born in a certain country and period, of a particular race and gender, with the means to travel and devote oneself entirely to studying and making art, within a milieu of likewise-enabled artists, interested patrons, and a tolerant government. I thought about how these probably shaped Matisse’s psyche, and his confidence and ambition—the aspects of his art that are most striking. The exhibition leads up to Matisse’s late-in-life cutouts. It seemed that every stage was a step towards this fullest expression of the master artist. I couldn’t help but feel a pang of jealousy, of all the time he was able to devote to his own artistic development. Upstairs, a large gallery displays Matisse’s cutouts, often using his signature fig leaf motif. I loved the color palette: rich, vibrant ultramarine, an even more vibrant magenta, black, red, yellow. These high-key colors underscore the graphic sensibility, yet the papers are hand-painted and improvised—you can see where the cutouts were cut and moved around again. Some of the collages are massive. You could spend a long time in this gallery, noticing how one’s eye moves around the musical compositions. While I was familiar with many of Matisse’s works, including his design for a stained glass window (above, left), I was surprised to see a number of ceremonial capes. These were lovely translations of Matisse’s free, expressive cutouts in satin appliqués. The palettes, designs, and relation to the body were satisfyingly unified wholes. Finally, another large gallery is devoted to Jazz, Matisse’s book of cutouts and handwritten pages. While I admired how the cutouts were slightly textured as prints (and appreciated the validation that handwritten pages could make an interesting exhibition), I was interested to read that Matisse was disappointed in the result—he found the prints lifeless, and the experience helped him realize that the cutouts could work as artworks in their own rights. Even “master” artists have to take risks and fail (even if such works are not perceived by others as failures). It underscored the sense that one could use a whole lifetime to fully realize one’s potential as an artist. This show—with a series of large photographs, a photo-installation, stereoscopic images, and two short videos—was a stunning introduction for me to this young French artist’s work. She’s concerned with architecture that is related to the sun, and fabricates what look like xerographic constructions that she shoots as immaculate black and white analog photographs. They’re quiet and wonderfully strange. There’s also an anamorphic installation of pieces of plate glass with cutout photographic imagery of an interior space. There are stereoscopic images of natural landscapes, like snowy peaks shrouded in clouds. The exhibition is really rounded out by two short videos. Both are single, continuous shots from afar of a large architectural structure, wherein identically costumed humans commence and end a repetitive task. In the first, workers in white bunny suits descend ladders inside a massive, dark factory space, coming from a skylight and dropping beneath the floor. In the second, divers climb up and dive from a diving tower in a river foregrounding a distant mountain. 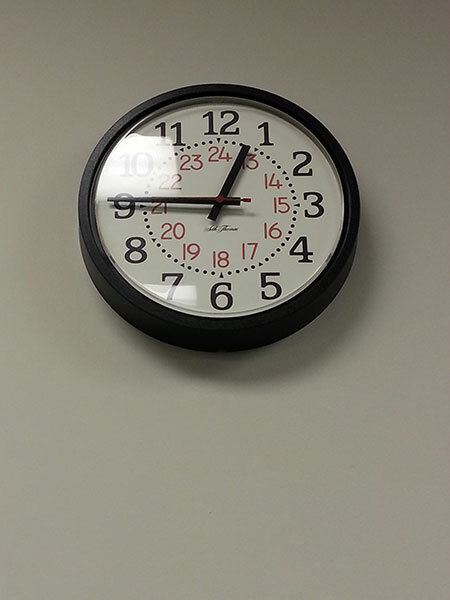 There’s only about a half-dozen of them, and they cycle on for minutes, becoming more tired, and finally stopping. The videos function like moving image photographs of an architectural space, or like little scenes about an unidentified place. There is a sense of myth, detached from any specific time and place. The Goudal show is excellently paired with Katy Grannan’s The Nine and The Ninety-Nine, portraits and scenes from a video-in-progress of the down-and-out in and around Modesto, CA. There are three works in this knockout show: a 2008 single-channel stop-motion animation, a 2011 video installation with multiple channels, More Sweetly Play the Dance, a new commission especially for the Eye that is a 45-meter-long, multi-channel, synced panorama. The first two contextualize how Kentridge arrived at the third. The actors form a parade, which starts out with a brass band in ornate dress and dancers. The tone is joyful. I appreciated the combination of expressive looseness and high-production value. The staging of the filming must have been a massive undertaking, yet the props are simple, roughshod cardboard elements. The score, audio recording, and audio playback are very well done, yet the projections do not match up edge-to-edge, echoing the collage-like feeling of Kentridge’s animations. As the film continues, however, the parade morphs into a darker, mournful procession. The sick push IVs, goaded along by others wearing head to toe plastic protection gear. There are gravediggers carrying shovels. One might think of Kentridge’s work in the context of the fallout of apartheid—something of the past, of a specific nation (though there’s a different resonance in the Netherlands, as South Africa was colonized by the Dutch)—but there are larger narratives, having to do with Ebola throughout Africa, that implicate all of us. More Sweetly Play the Dance is a powerful example of Kentridge’s ability to blend the specific, the poetic, and the topical. Every act of enlightenment, all the missions to save souls, all the best impulses, are so dogged by the weight of what follows them; their shadow, the violence that has accompanied enlightenment. While I’m not totally comfortable with the futility and pessimism in the statement, it made me think about the Truth and Reconciliation process in South Africa, in contrast with the persistent institutional racism and denial of privilege going on in the US now. We also went to De Appel Arts Centre, the Stedelijk Museum Bureau Amsterdam (project space) and the Huis Marseille Museum of Photography. Cool spaces, but I personally didn’t connect with the current exhibitions. Privilege the viewing experience. While I had aspirations to visit the Van Gogh Museum, I just couldn’t bring myself to deal with the long lines and crowds. I’m not interested in elbowing my way into a clear sightline around a famous, expensive painting as other tourists snap photos. It’s too stressful and unpleasant. It’s not a good way to experience a work of art, and I am glad that I know myself well enough not to visit out of a sense of duty only. I did have the odd feeling of recognizing works from art history books at the Matisse show. The reproduction does detract from the aura of the original, but more so does hype. Safety first, and all that follows. I really like riding a bicycle but I rarely do. There are too many reasons not to—fear of being hit by a car, truck, or bus; concerns about personal safety after nightfall; poor bike lanes; not enough bike parking; bike theft; and aggressively car-centric attitudes in general. When you eliminate or minimize such reasons, it’s liberating. 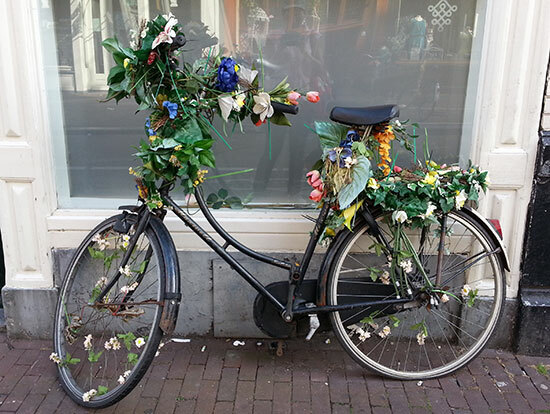 I enjoyed the integration and espousal of bike culture in Amsterdam during my short stay, and wonder how living in such a bike-friendly place impacts your lifestyle and psyche over the long term. We saw thousands of bicyclists everyday, including parents toting one or more children, and very few private cars on the road. Bike lanes were protected and clearly marked. When lanes are shared, drivers were almost always patient and respectful. A tram stopped to let us cross the street. That feeling of safety is maybe one of the most foreign and novel things I experienced—such a contrast from the outright aggression that cyclists face and have to psychologically armor themselves against when riding in NYC. This pretty much sums it up. Life’s too short to hate your commute. Looking back at my 17-day residency. The stunningly picturesque Mt. Hood is visible from many parts of Portland. How it came about. I’d been invited by the Portland ‘Pataphysical Society (“‘Pata,” for short) to exhibit The Eve Of…. I needed to be in Portland to install the large sculptures and installations. With our budget stretched thin by the shipping and transportation costs, ‘Pata contacted c3. I’d heard about c3 from the art collective ERNEST—which is in a long-term, ongoing residency there—and had received updates about Andy Coolquitt’s residency for his Disjecta show. 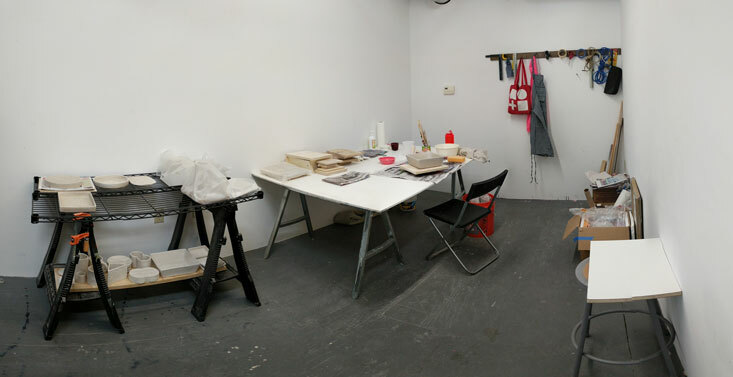 c3 was available and offered not only to let me stay during installation, but to come out earlier for a residency to make new work with a membership to Pulp & Deckle, the onsite papermaking studio they incubate. I said yes. Getting settled. Founder and Director Shir Ly Grisanti and Program Manager Erin Mallea got in touch and asked me what I needed. They were communicative, prompt, professional, responsive, and happy to triangulate with third parties as needed. They picked me up at the airport; lent a bicycle for getting around town; connected me with a lender of woodworking tools; and hooked me up with advising hours from Jenn Woodward, who runs Pulp & Deckle. Furthermore, they arranged for me to present Make Things (Happen) at PSU’s MFA in Social Practice un-conference, Assembly. A discussion about Make Things (Happen): Christine Wong Yap with Lexa Walsh and Julie Perini. Presented by c3:initiative and Portland ‘Pataphysical Society for Portland State University’s Assembly 2015. Photo credit: Joe Greer. c3 occupies a building with a small office, a cozy kitchen, a front room with a glass garage door that was an exhibition space, a larger middle room that I took over as a studio space, a shared bathroom with good-smelling shampoos and lotions, a closet with a large industrial sink and a few hand tools, Pulp and Deckle, and a one-room residence. The residence is sort of a white concrete cube afforded privacy with heavy black curtains. It’s outfitted with low furnishings that lend it a peaceful feeling—a comfy futon, pine credenzas with books and magazines, a lounge chair, and a tri-fold mattress, which turned out to be a nice place to sit cross-legged and work on my laptop. There’s also a large gated yard with patio furniture and plenty of space. c3 is located in St. John’s, a neighborhood in North Portland. It feels like a small town. Its main street reminded me of Albany, CA, with its little movie theater, many bars, and vintage look. Transportation is pretty easy, with two bus lines that run to the galleries in the Pearl district. Shir, Erin, and Jenn were incredibly accommodating. They said I was pretty much free to use anything in the office, kitchen, and closet. That meant I could print activity sheets for my Assembly event, had access to basics like olive oil and spices, and could use their washer, dryer and detergent, etc. These things seem small or mundane, but they make a big difference when you’re traveling. What I did. In the first week, I made paper at Pulp & Deckle. I came to find the process of making paper to be pretty fun. The large sheets I started out with were technically challenging and physically demanding, so when I later made US letter-sized miniature multiples, I couldn’t stop giggling at how easy it was. Making miniature multiples at Pulp & Deckle. I’m very grateful to Shir, Erin, Jenn, and Devan for providing the space, equipment, and knowledge for me to be productive. I feel really lucky to have been the recipient of so much generosity and hospitality. It’s an incredible feeling to know that I have plenty of time and all of the tools—physical, technical, and psychological—for the task at hand. Results. I’m very happy with how The Eve Of… looks at ‘Pata and also at its satellite location in the PDX Contemporary windows, alongside Ethan Rose’s excellent solo show. I owe huge thanks to Josephine Zarkovich and David Huff at ‘Pata, as well as Caitlin and James at PDX Contemporary. During the openings on First Thursdays, I ran into old classmates who’d moved to Portland recently, collaborators who happened to be driving through town, and even a colleague who I’d recently met in Wichita. Moreover, so many people came in to the galleries—friends, colleagues, supporters, and the curious. It was a very satisfying conclusion. The Eve Of…, including works created in residence at c3:initiative, will be on view through July 18 at the Portland ’Pataphysical Society in Portland, OR. A satellite exhibition is on view until June 27 in the windows project space at PDX Contemporary. Correction: The link to photographer Joe Greer has been updated. Some things I’ve done, thought about, and seen in the first 12 days of a 17-day residency in Portland, OR. On Saturday, I installed two pieces from The Eve Of… in the window project space at PDX Contemporary, with a little help from JZ, DH, Caitlin, and James. It’s viewable 24/7 at the corner of NW Flanders and NW 9th. It’s a satellite of the larger exhibition at Portland ‘Pataphysical Society (‘Pata), which opens Thursday (First Thursdays) from 6-9pm, at NW Everett and NW 6th. The exhibition at ‘Pata will include new works—four large pieces of handmade cotton rag paper, which I made with the tutelage of Jenn Woodward at the Pulp and Deckle paper making studio thanks to support from c3:initiative. The paper is created for display in the ‘Pata windows, which will also be viewable 24/7. Make Things (Happen) PSU Assembly brochure page. Illustrations of activities by Kari Marboe & Erik Scollon, Piero Passacantando, and Tattfoo Tan. Last Wednesday, I had a chat about Make Things (Happen) in PSU Assembly. It was sponsored by c3:initiative and located at Portland ‘Pataphysical Society. I invited Make Things (Happen) participating artists Lexa Walsh and Julie Perini to present their activity sheets and have a dialogue. Lexa asked me how I felt about shared authorship—I am interested in exploring it, and talked about the creative freedom I tried to offer artists, since I wasn’t able to offer remuneration. This spurred an audience member to ask Lexa and Julie what motivated them to participate. Lexa mentioned that this was a easy extension of an existing project, and Julie explained it’s hard to think of who would fund projects to fight white supremacy. I really think it would be amazing to see this project at the airport or library or DMV or city hall or some kind of public space…..
She was so smart about curation and public space. I should heed her words. These are just one more example of so many bits of wisdom she shared. Thanks to everyone who attended, and who made it happen: Julie, Lexa, Shir, Erin, Josephine, David, Harrell, and many more. I made paper before, once, in Nance O’Banion’s Bookmaking class as an undergrad. My memory of it pretty hazy, except for an image of the sheet collapsing as I unsuccessfully tried to “kiss” the wet paper pulp off the mold and onto the drying screen. It’s technical, but much of it, like in printmaking, is by feel. You screw it up to know where it goes wrong, and then by experience feel when it’s right. For example, you figure out how much retention aid is enough, which you can feel in the softness of the water. It’s physical. I made four 43×56″ sheets, each comprised of twelve sheets from a ~15×15″ mold. The water’s surface tension provides a good amount of resistance when you pull the mold. You sometimes have to lift and pour big buckets (30-40 pounds). A backache after the first day was all the reminder I needed to use my core and legs on subsequent days. Oddly, I think having done vinyl signage helps. Though the materials couldn’t be more opposite in many ways—natural vs. plastic, historical or niche vs. ubiquitously modern—the processes share releasing a fragile sheet from one surface to another. It’s about timing and pressure. It’s pretty magical. There’s no binder. The fibers just stick together. Because it’s very physical and intuitive, it’s a great process for finding flow. Jenn is a great teacher—very knowledgeable, patient, and no-stress. Pulp & Deckle‘s classes and private workshops are affordable. Recommended! Time management. You might think that artists who are also art handlers will take less time to prepare for and install an exhibition. This is not necessarily true. 1. We can nerd out on details. I built a plinth for a work that usually sits on the ground, and a box for A/V that could just sit a shelf. I’m also sewing light blocks for ‘Pata’s clerestory windows and sheer window coverings to layer behind the paper. 2. It takes time. I underestimated how long it would take me to build boxes and pack my work to ship out here. Yet I work on crews where we do that for several days or weeks at a time. The scale of my work is smaller; but still, in this case, it included two large boxes the sizes of doors. 3. Because you never know when you’ll need to problem-solve. What can go wrong when you’re traveling, using local sources, unfamiliar tools, and new spaces? The patience and generosity of friends and strangers go a long way. Bathing in the afterglow of the Postcards from America opening at Newspace Center for Photography; it was pretty cool to see dudely big-deals like Alec Soth and Jim Goldberg mixing it up with local subjects (a retiree, a girl named Cherish, a physical therapist who served vets, an advocate for Iraqi refugees) and PSU Social Practice students. The event was part of PSU Assembly. Susan Meiselas‘ project to raise the visibility of VOZ, a worker-led organization to empower immigrant workers is a smart, worthy way to use photography in social practice; limited edition screenprint posters are available to raise funds for printing. It’s super cute and signed by the Portland Postcards from America photogs. I was tempted. I previously thought Magnum was just a hotshot agency, but in a recent talk at Portland Art Museum, they explained that it’s a co-op run by photographers for photographers, and had to find new ways to support the work they want to do. Yale Union/YU Contemporary‘s new exhibition by Willem Oorebeek. We were only there for a few minutes between engagements, and my largest impressions are of the space (a huge renovated industrial space not unlike Mass MOCA or DIA:Beacon, with beautiful light) and the architect-made exhibition design (2×4 framing on 12″ centers, very selectively sheathed). There were reproductions from magazines, and sheets of glass over rubber flooring with round nubs intended to read as pixels, though I thought of LEDs. There were black-on-black prints (black lithographic prints over a variety of mediums) that had optical or durational effects—you had to stand right in front of them to see them, which was engaging in how it forced an intimate relationship with the image within a massive space. Woodwork. Borrowed tools from a suspension-tree-house maker named Devan. A 12″ compound miter saw, Skil saw, and compressor and nailer (yes!). Nice blades, smooth sailing. I forgot to pick up clamps, though, so I nailed a 1×2 as a guide wherever I needed it. It hit 92ºF and the patio umbrella was a savior. Signs, packaging design and more. 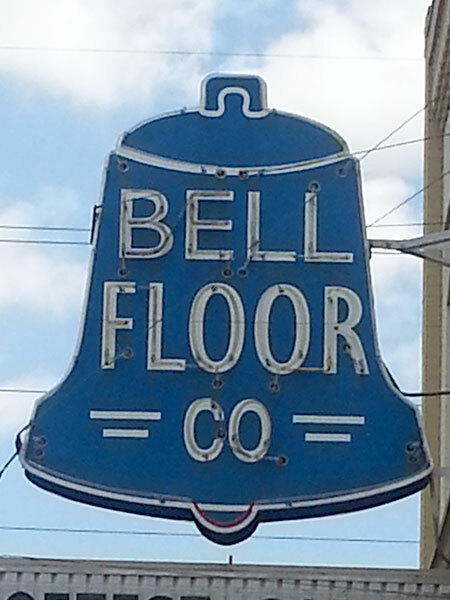 Fitting sign for a sturdy, spacious, modern building. Main Street. 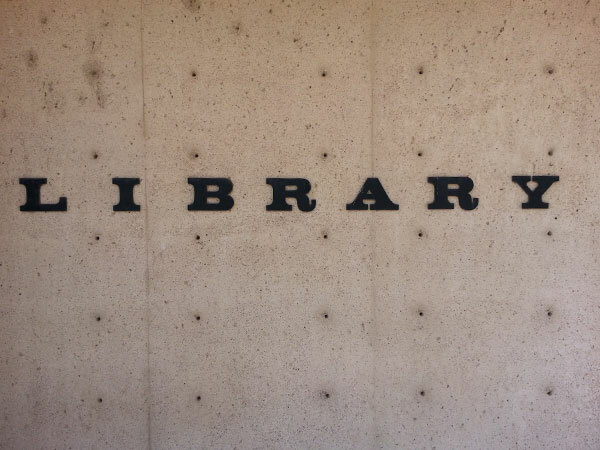 A study in function and typographic contrast. Wichita Public Library, Central Branch. Such a high-minded engraving. I love how prominently the arts feature; hard to imagine a corollary image today. Framed and on display the library, in the genealogy section. 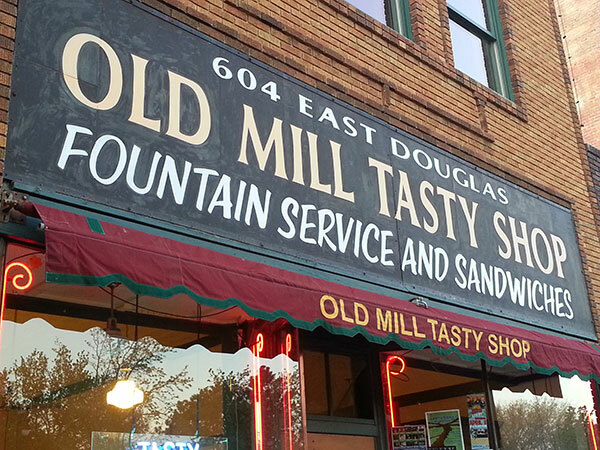 Decades of typographic whimsy. University yearbooks. Neon sign in the Delano district. 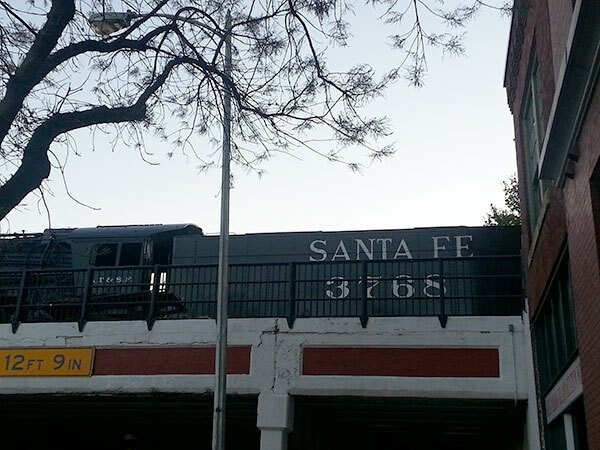 The two different sized strokes on the sides of “co” are kind of sweet. 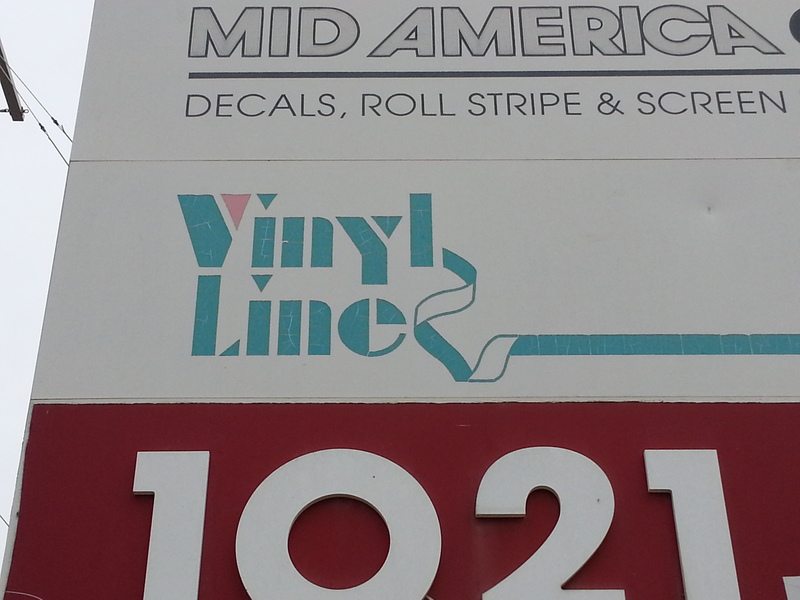 Diner era conjuring a wood type era. Bubble letters with drop shadow and Helvetica. The saw is indeed avocado green. And it still cuts like a beaut. Turn the wingnut to adjust the cutting depth. 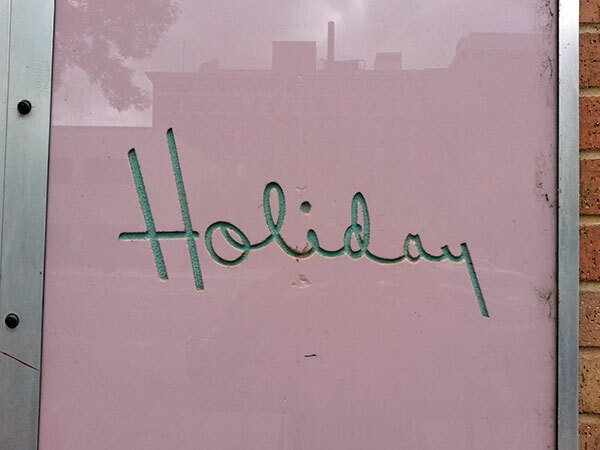 Avant Garde outline above aqua and pink stencil face with ribbon. Get it? 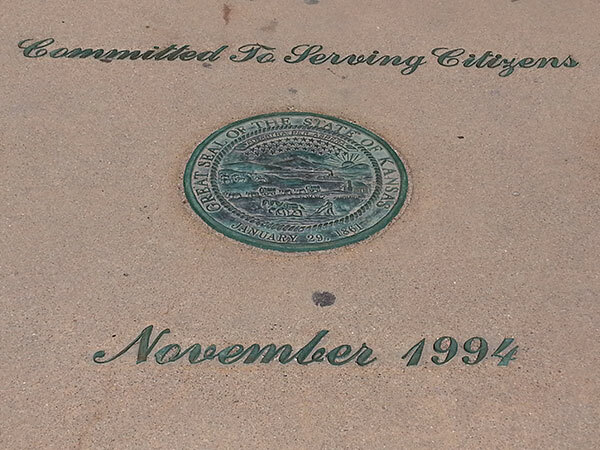 It’s copperplate script cast in bronze. What I do like is Kansas’ state motto: Ad astra per aspera (To the stars through difficulties). 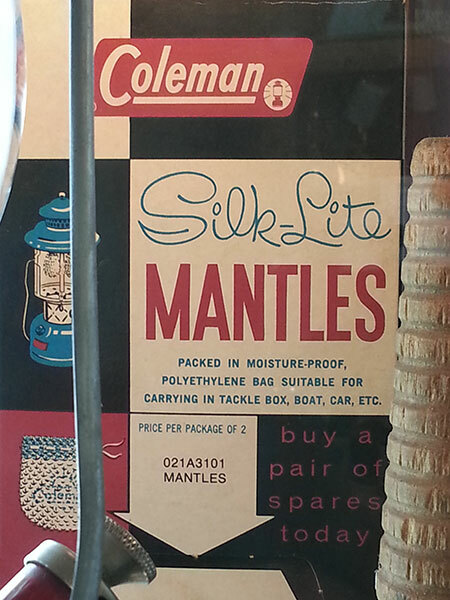 From Coleman’s museum and store. 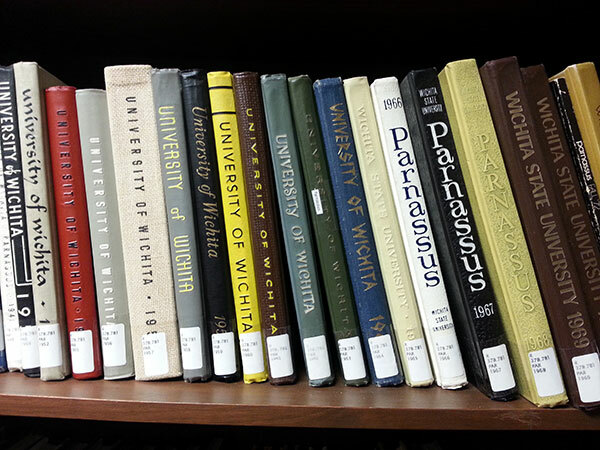 Coleman was founded and operated out of Wichita (along with many aeronautics companies, and Pizza Hut). 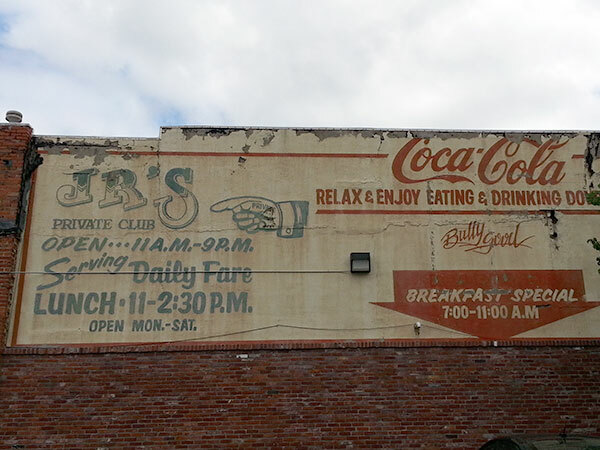 Another period of effusive typographic contrast; this one, a heyday of illustration. 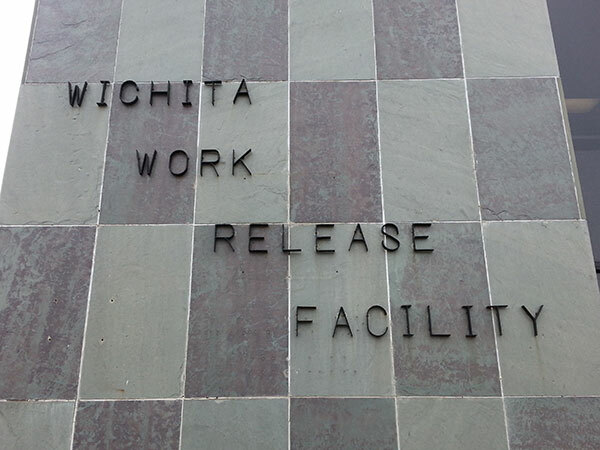 Maybe not a happy place, but someone probably made these letters, and decided how to stagger them across the checkerboard granite wall. 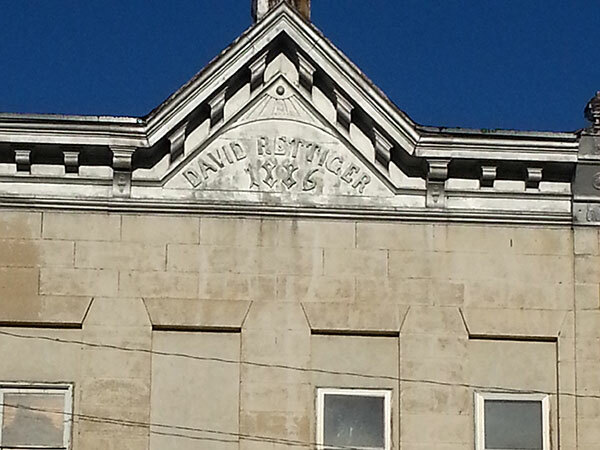 Adjacent to the Transportation Museum, on Douglas Street. Trajan-eqsue Roman capitals over brush script, painted and re-painted? Yes, please.